A funny thing happened in 2015. Well, besides the oft-ironic youtube rise of the current political horror show. In personal news, my apartment-dwelling wife and I made it from a waitlist to our very first community garden plot. We've since moved into a larger plot closer to our home that is still somehow in semi-inner SE Portland, but my point is coming.....I've been a farmers market-obsessed since my first spring in Portland, back in uh, 2005. That's a decade earlier than I am typing, woweee. Gardening brought this interest in all things fresh and seasonal to a whole new level. She does the vast majority of gardening, and I do the cooking. It’s the best. But, back to the farmers market, because I haven’t definitely stopped going. We can’t grow everything, even if we wanted to. 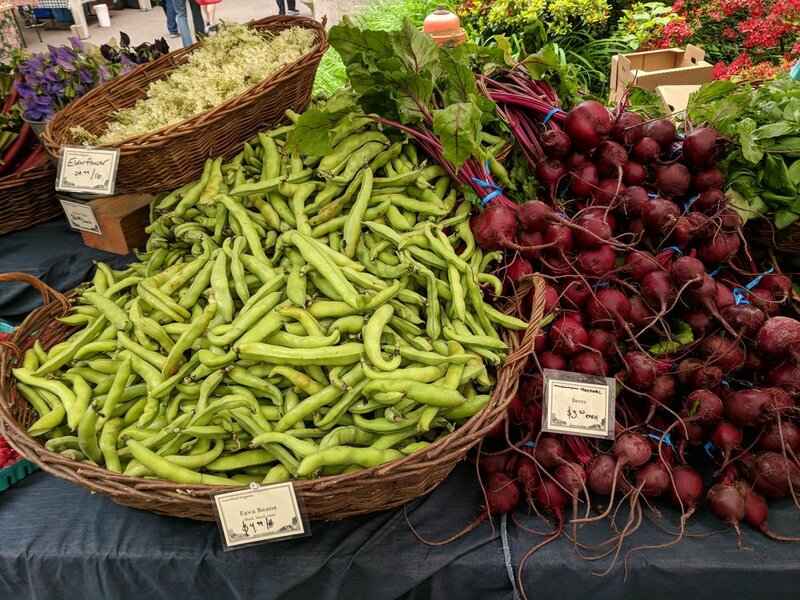 Whether I’m here in Portland or traveling elsewhere, visiting a farmers markets is a freaking delight – educational, inspiring, and making you feel like how Oprah feels about bread, without the guilt. It’s a way to supplemental your “normal” grocery shopping or home garden efforts, bulk bin trips and Trader Joe’s staples. You’ll liven up your kitchen and cooking styles while learning to eat seasonally. Find a farmers market in your area. I don't know where you live, you do. Go to the market, see what's beautiful aka in season. Pick up some fresh goodness. Oooo, ahhhh. Go back the next time! Plus! Here in the Portland metro area, not only do most markets take cards, but a bunch offer matching SNAP dollars, which means even more goodness. Been there, done that. It’s more than the pull of vibrant, intoxicating colors, shapes, smells and truly, the flavors of shopping and eating through the seasons – it just makes sense. Look, import/export goodness is fabulous and I’m stoked to stock up on Thai coconut milk, Japanese sesame oil, Chinese fermented hot bean paste, French stone ground mustard, Ethiopian berbere, and whatever other quality goods the modern day spice and tea trade can offer me, but with few exceptions (okay, fresh lime and curry leaves, for two, that’ll go into my freezer after an initial dish or two), I don’t want to eat produce that’s been wrapped in plastic and shipped across the globe….or across the country (cough, cough, or sealed into a plastic bag at TJ’s). Granted, I am aware that I do not have children and can make the time to hit my garden and/or market, but come on. The Pacific Northwest offers an unbelievable, non-gmo bounty of gorgeous seasonal produce, all-year round. Trust me as someone whose wife grows hearty winter greens in the colder months, and who checks out the weekly, year-round farmers market outside of People’s Co-Op any month of the year. Kale is perpetually in season, people. Plus, there’s everything you can dig into your cultural roots (or cold storage) and learn to store from seasonal goodness, like fruit preserves, roasted tomatoes, basil pesto, homemade bouillon, and dried peppers, to name a quick few. I just used the last of a gifted jar of homemade raspberry preserves I received in 2015 (which I know because it was on the label) in a jam-swirl coffeecake this past week. And once I start pickling, it won’t seem to stop. Your looking at what I picked up last Saturday (May 19) at the downtown Portland Farmers Market. Truthfully, I’m partial to another farmers market across town that hasn’t started yet, but there’s no beating the tremendous downtown happening. It’s even better if you go early and get first picks and even more room to explore. If you know me, you likely know that I’ve taken to capturing my haul and documenting it. La la la. I do my meal planning both while I’m shopping, letting those colors and what’s new grab my attention, and once I’m at home cleaning and putting the produce away; noting what needs to be used sooner vs. later, and so on. First things first, after my wife devoured the strawberries as soon as she came home from work, we’ve been tackling the beautiful lettuce, as it’s freshest, with “big salads”, topped with a carrot-ginger-sesame-miso dressing appearing on every dish other than breakfast (Full disclosure: we’re not really salad for breakfast people, deal with it), and the sweet, clean turnips themselves being used in multiple stir-fries, curry fried rice, and the aforementioned salads. The turnip greens, while a little more on the light side, will be stir-fried with toasted garlic and rice vinegar and packaged up for lunches with soba noodles. The exciting, first-of-the-season scapes are used whenever I’m mincing garlic, which you know is at least once a day. If one somehow makes it past a week or so – which isn’t likely but hey, you never know – it’ll be thrown into a fantastic stock or pickled with the leftover turnips, perhaps. The second head of lettuce will go into more salad, used as a lettuce wrap, on the mini tacos we can’t get enough of (which means grabbing from whatever salad I’ve thrown together) or as summer/salad rollz with fresh sweet Thai basil from our garden and a peanut-hoisin dipping sauce. The moment I saw the zucchini, I got giddy, and thought 2 things 1) Omg, it’s zucchini time and 2) I’m making kung pao. My wok never gots enough love because we live with an electric stove top, but it’s always worth going for it. This kung pao has yet to happen, but potato/zucchini/black bean/unpork seitan tacos since have, and I don’t plan to give up on the dream. The sugar snap peas are for snacking with hummus, slicing for salads, and more stir-frying. Oh yeah, the wok is totally going back into rotation. As for my double broccoli-adventure, the purple could be roasted with olive oil, garlic, sliced lemon wheels (I don’t think I’ve ever said that before and I have mixed feels but here we go) and crushed chilis, and the flowering broccoli beckons for wok-time with a bit of mushroom oyster sauce, sweet Thai soy sauce, coconut sugar and more garlic. Naturally, this talk of Chinese and Thai dishes makes me immediately realize there’s an Italian pasta or pizza dish missing from the culinary forecast, and broccoli would be lovely in either with you guessed it – even more garlic and minced or braised scapes. I would say that’s everything, but hey, didn’t I mention the need for mini taco night? We keep a lot of dried beans in our household, including dried scarlet runner beans from last summer’s bounty, and beans + pickled turnips + lettuce + hot sauce + avocado + maybe some seitan + chickpea queso = more than enough for mini taco night. I picked up another pack of mini tortillas at the People’s weekly market in the following days we saw such a need for cute little tacos. So! What would you make with all this stuff? What's your farmers market style? ‘Cause the more ideas and whims and suggestions and cravings, the better. Oh, what a beautiful mooooorning…. We got the beet. I mean, turnip. TURN UP, the beat. THIS IS WHAT I’M TALKING A-BOUT ! Do you have anywhere you can put a large pot or window box? Is there a community garden near you? A friend or family member with yard space to share? It’s time. In conclusion, I hope some people can relate, and others are inspired by this, even to try just one new-to-them spring offering. And duh, certainly, if you’re in the Portland, OR metro area and your interest is piqued or you sure wish it was and/or never know what to do with your broccoli besides boiling it, do join us for Vegan Iron Chef's June 29th’s “HERB YOUR ENTHUSIASM”, our summer fundraising event + vegan potluck social that’s all about...all of this. Get inspired, get tickets, get cooking. RSVP TO JUNE 29'S SEASONAL VEGAN SHINDIG!